According to an editorial in the May 22 issue of IHS Automotive SupplierInsight , the future of the carbon-fiber-reinforced plastic (CFRP) market looks promising, with opportunities in diverse applications such as body in white (BIW) chassis systems, powertrain systems, exteriors and interiors. Carbon fibers are organic materials that have been heat-treated at temperatures of 1,000° to 3,000° C and generally contain 92 to 99.9% carbon. Due to their strength and stiffness, light weight, strength-to-weight ratios, corrosion resistance, workability and other favorable properties, they are mainly used as reinforcing agents in high-performance composites. A major growth driver for this market in the long run will be increasing demand for lightweight materials in the automotive industry driven by stringent government regulations on greenhouse gas emissions and fuel efficiency. Saving even a few pounds of a vehicle’s weight improves performance and fuel consumption. Considering its potential in the automotive industry, suppliers and automakers are already making significant investments in order to develop a robust supply chain for the lightweight material, said SupplierInsight. Currently, Toray Industries, SGL Group and Mitsubishi Rayon are among the major suppliers of the material. Toray’s current annual global carbon-fiber production capacity is nearly 44,000 metric tons. In 2014, Toray acquired Zoltek, which gave Toray entry into the industrial-grade, large-tow carbon-fiber market, said SupplierInsight. In February this year, Toray announced plans to strengthen its carbon-fiber business by investing JPY100 billion (around $880 million) over the next three years, according to Asia Nikkei Review . 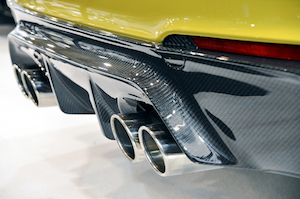 Toray’s carbon-fiber business, which accounts for annual sales in the range of JPY10 billion to 20 billion, currently focuses on exterior parts. Zoltek has also recently announced plans to double production capacity at its Mexican facility to more than 10,000 tons of carbon fiber annually. Together with existing carbon-fiber capacity at its Hungarian facility, Toray’s total global capacity will be more than 20,000 tons per year. In January of this year, Mitsubishi Chemical Holdings, through its U.S. Mitsubishi Rayon subsidiary, said it would acquire SGL’s carbon-fiber plant in Evanston, WY, currently run by Germany’s SGL Group. That will add 1,000 tons of annual output capacity and will help the company address rising demand for the material. Magna and Ford developing CFRP in chassis applications. Magna has developed a prototype carbon-fiber-composite sub-frame in cooperation with Ford. The new concept can deliver a 34% mass reduction over stamped steel, said SupplierInsight. Brian Krull, Magna’s Global Director of Innovation – Exteriors, will be a keynote speaker at the upcoming Plastics In Motion summit on June 5, 2017, in Troy, MI, talking about how advanced plastics and compositesm are shaping the car of the future. Obviously, cost is still an issue, just one of several issues surrounding the use of CFRP in automotive manufacturing. Dale Brosius, Chief Commercialization Officer at the Institute for Advanced Composite Manufacturing. Innovation (IACMI), told attendees at the recent SPE Thermoset TopCon in Scottsdale, AZ, that while there are a wide range of processes and applications, the thermoset industry still gets a “bad rap for slow process times” and the perception that the material is not very tolerant of damage. SupplierInsight noted that manufacturing cost is the reason that CFRP parts “are mostly used in luxury or performance cars and not in mass-produced vehicles.” However, “as automakers increase their investments in CFRP, costs are coming down slightly.” As the market continues to grow “with supply increasing to meet rising global demand,” SupplierInsight projects that in the next few years overall world consumption of carbon fibers is expected to grow 8 to 9% per annum. According to IHS Markit, the global consumption of carbon fibers stood at 61.6 thousand metric tons in 2015, up from 43.5 thousand tons in 2012. This is expected to increase to 92.36 thousand metric tons in 2020. Global capacity has grown from about 101,000 metric tons in 2012 to more than 126,000 tons in 2015. Capacity has mainly increased in the United States, China and South Korea. By 2020, the average car will incorporate nearly 350 kilograms of plastics, up from 200 kilograms in 2014. Usage of carbon fiber in automotive manufacturing is expected to increase to 9,800 metric tons in 2030, up from 3,400 in 2013.